Greetings Loyal Airmen, we hope all of you who were off last weekend, the traditional Spring Break for most students in the US, had a great time and maybe some of you even got away from the Norther Winters Blasts holding the North East captive. 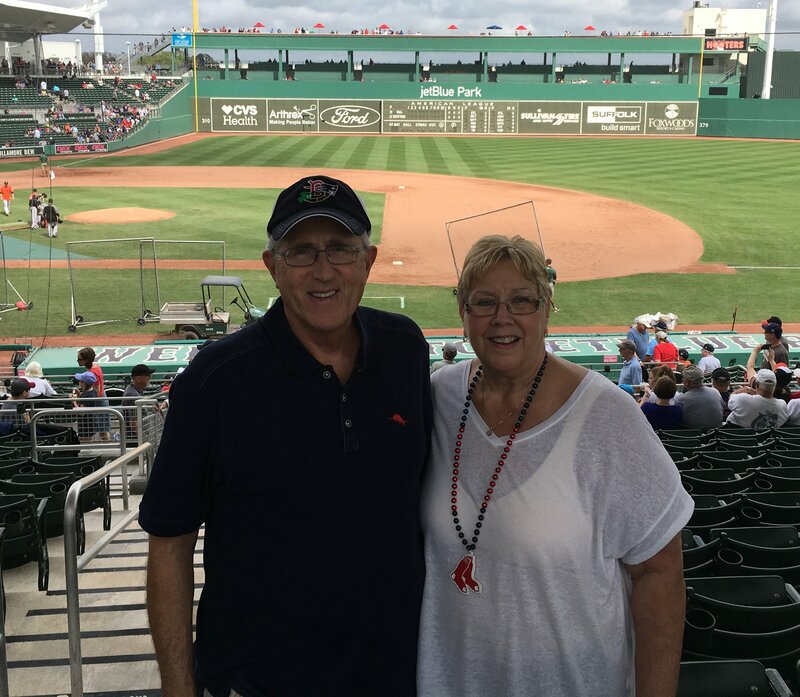 Valerie and the Air Chief headed for wonderful Ft. Myers, Florida where one of our first stop was at Jet Blue Park, better known as Fenway South where we had the pleasure of catching a Red Sox game and seeing our favorites take the filed once again. 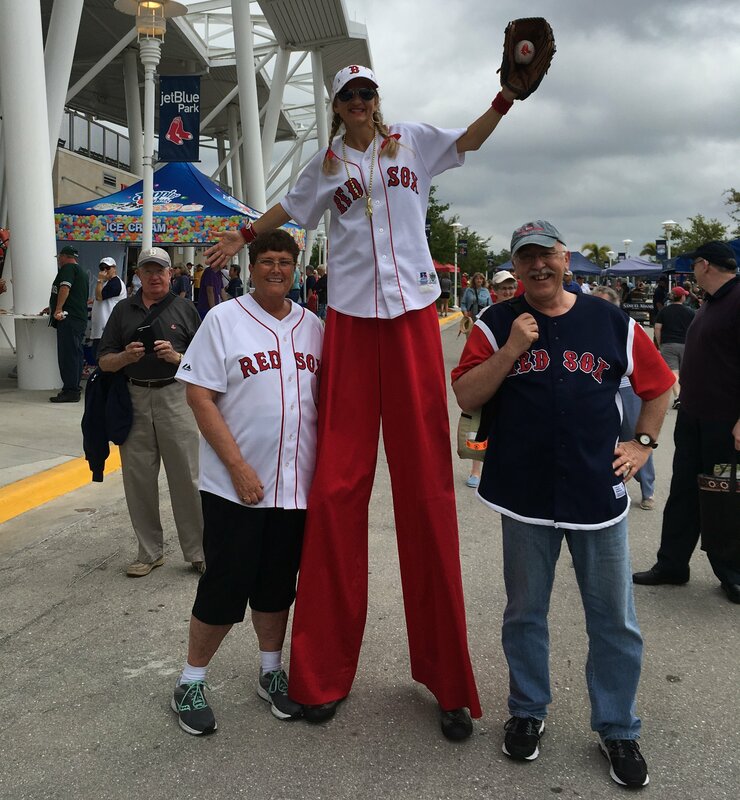 We even got to meet Tall Minnie. How that woman gets along on those stilts is a marvel. For those of who not in the know, when Jet Blue Park was built, they had it done to the exact specs of our beloved Fenway in downtown Boston. That way the new rookies coming to the park each Spring can actually play ball in a field that will mirror the one they hope to launch their careers on. Joining us again on this Florida adventure were Val’s sister Barbara and her husband Gus, two of the nicest, most generous souls the Air Chief has ever known. Spending any time with this pair is always much, much fun and this trip was no exception. Sadly when headed back to Colorado, they were returning to endless winter plaguing New Hampshire still. The park itself also has some really cool features including a statue of retired slugger and Fenway favorite, slugger David “Big Poppi” Ortiz made entirely of Leggos. 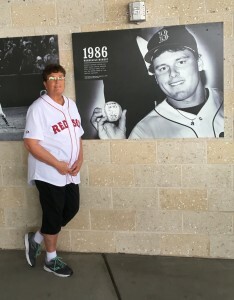 Then when Val saw this poster of ace pitcher Roger Clements, she just had to have a pix with it. 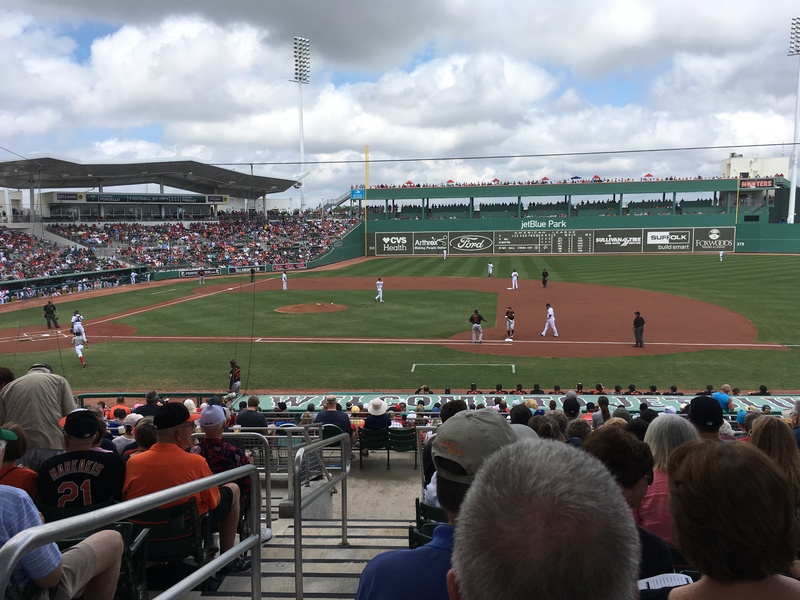 Baseball season opens officially on March 29th and our beloved Sox will be back in Florida to take on their division rivals, the Tampa Rays. 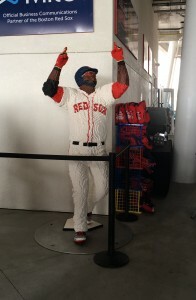 GO SOX!!! One of the things the Air Chief always makes sure to do when in Ft. Myers is to hooking up with his baby sister, Mrs. Ann-Marie Cormier and her husband Norm. 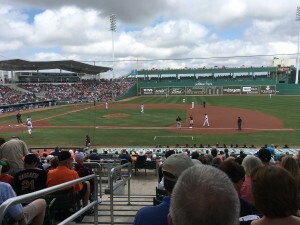 New Hampshire transplants themselves, they love this city and have no intentions of ever return back north to the cold. 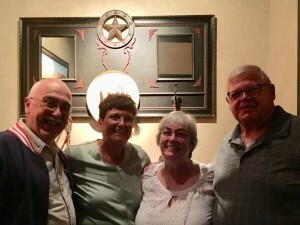 Both of them looked great and the four of us, along with Barbara & Gus hit up a local Texas Longhorn for some good eats and loving conversation. 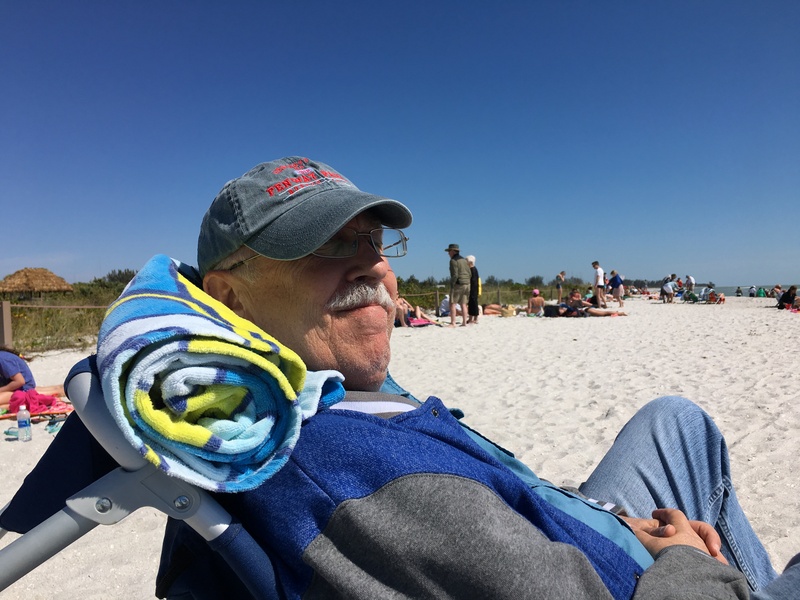 For those of you wondering, “Hey, no beaches?” Let us assure you, Ft.Myers has several great beaches, sad the temps never went of 71 degrees on the few days we got to visit them, whereas the actual water temp was 86. Meaning if you dared step out of the water, the breeze coming off the water would be very, very chilly. We opted to sit back in our fold out chairs and catch a few rays. 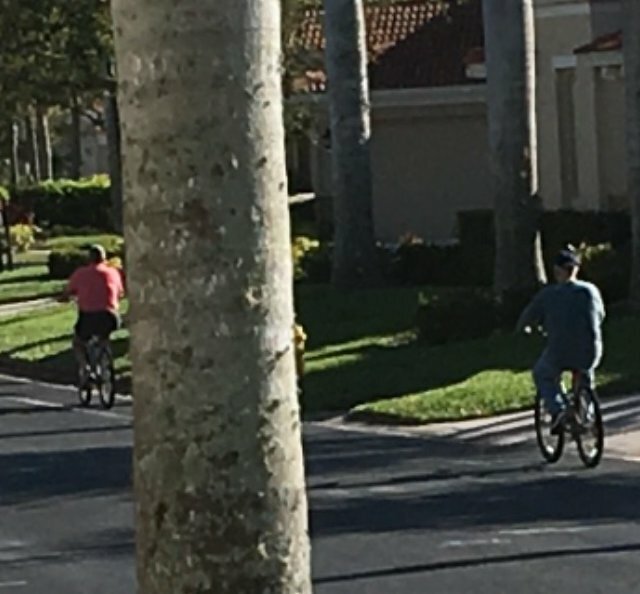 Oh, and before we forget, the Air Chief, didn’t hesitate a second to jump on a bike and go riding with Gus when the offer was made. Although honestly we cannot remember the last time we actually got up on a bike. The photo above has Gus in the lead with the Air Chief hot on his trail. Guess what they say is true, you never forget how to ride one of those things. It was so much. 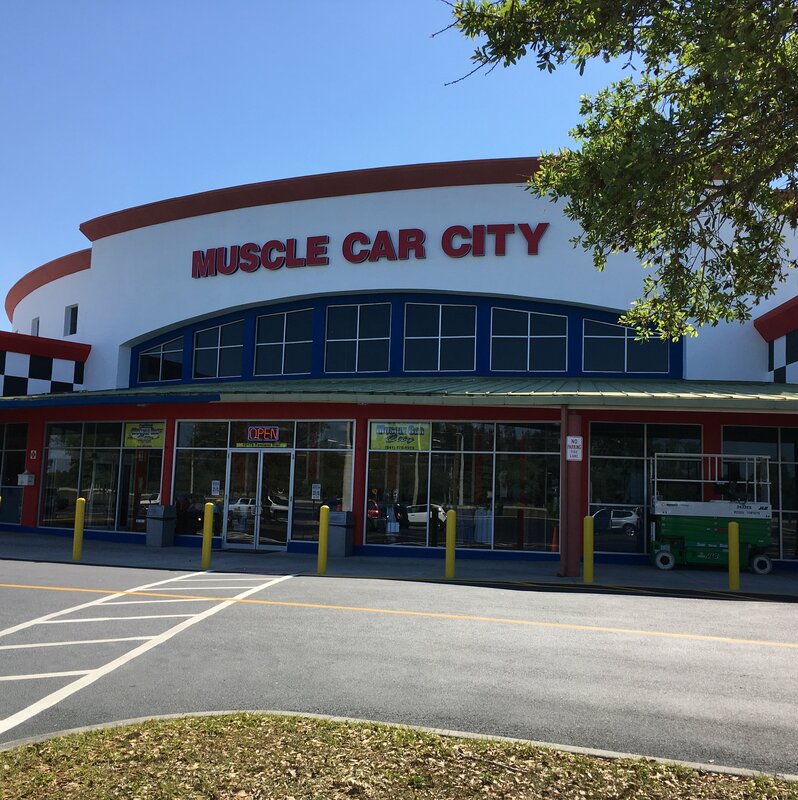 Now if you wanted some classier transportation, on the last day of vacation we all visited a place called MUSCLE CAR CITY with over 175 classic muscle cars on displays from several different eras. 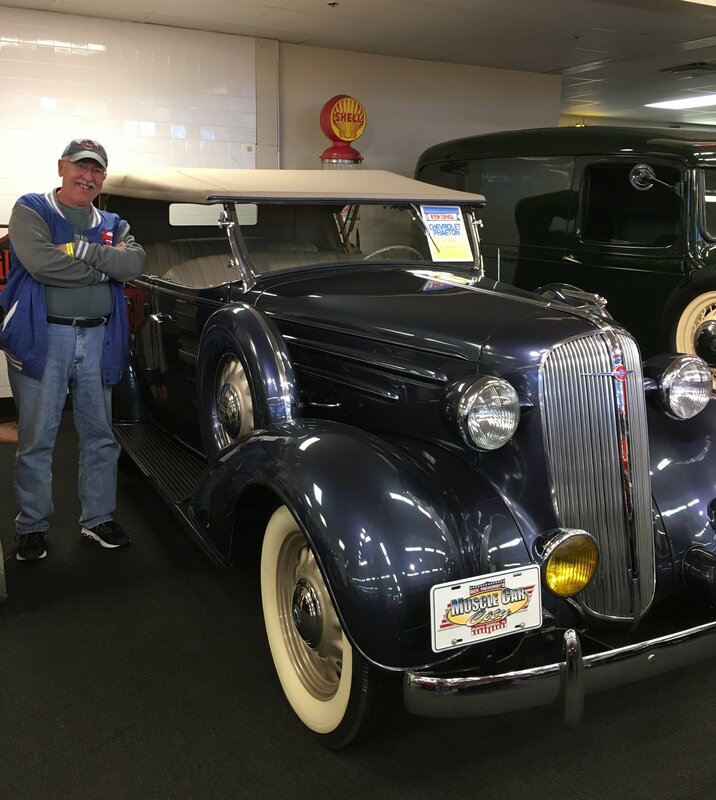 And while Gus was fawning over the sweet rides he’d had as a high-school teenager, the Air Chief was naturally drawn to the 30s vintage models, thinking of all those great pulp yarns these machines will inspire in the future. 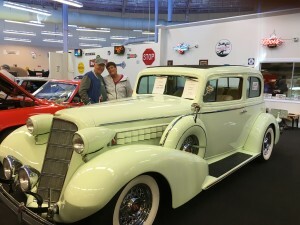 A lime green 1935 Cadillac. Check out those fenders, running boards and headlamps. Cars had so much style in those long ago days. All in all it was a great seven days that really came and went to fast. 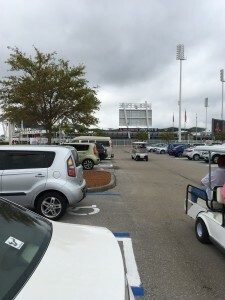 Hopefully we’ll be back there again many, many times. And least you think because the Air Chief was gone all week, nothing got done at Hangar 27, nothing could be further from the truth. 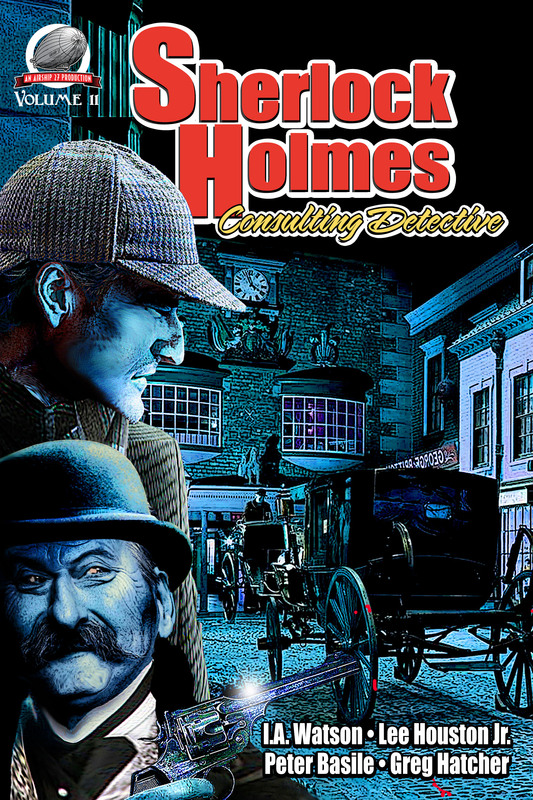 During our absence, Chief Engineer Rob Davis completed assembling out two latest anthologies and got them out to the market. 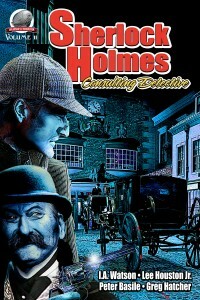 SHERLOCK HOLMES – CONSULTING DETECTIVE, sporting a gorgeous Laura Givens cover, features stories by I.A. 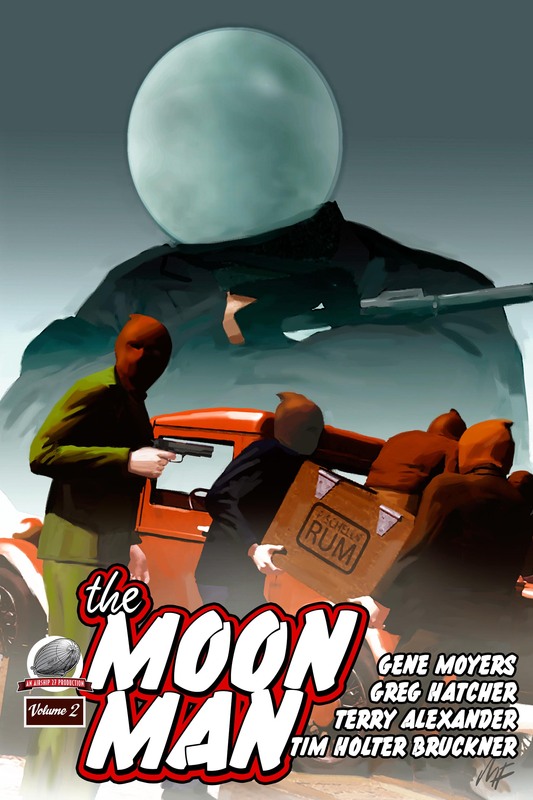 Watson, Lee Houston, Jr, Peter Basile & Greg Hatcher with Rob providing the interior illustrations. THE MOON MAN Vol 2 has stories by Gene Moyers, Greg Hatcher (he’s a busy guy) Terry Alexander & Tim Holter Bruckner with a cover by Mike Fyles and interior illustrations by Richard Jun. As ever we are extremely proud of them and hope you’ll check them both out. And there you have it, Loyal Airmen. Traveling is always fun but then again it is also always nice to come home. See you all next week.